Winner: Intracranial gadolinium deposition after contrast-enhanced MR imaging. McDonald RJ et al, Radiology, March 5, 2015. To learn more about this paper, click here. The choice of this study as Scientific Paper of the Year reflects the heightened awareness of a disturbing new finding: deposits of gadolinium in the brains of patients who received MRI contrast. In the study, a research team led by neuroradiology fellow Dr. Robert McDonald, PhD, from the Mayo Clinic in Rochester, MN, examined tissue samples from the brains of 13 deceased patients who had received gadolinium-based contrast agents (GBCAs). They compared this group with 10 other deceased individuals who had not received contrast. The researchers found concentrations of gadolinium in the dentate nuclei, pons, globus pallidus, and thalamus of the 13 patients who had received GBCAs. In fact, the deposits were present even in patients who received as few as four doses of gadolinium contrast. Axial T1-weighted MR images show the posterior fossa at the level of the dentate nucleus. Image B is of a control group patient, while image D is the first MRI exam and F is the last MRI exam of a patient in the contrast group. 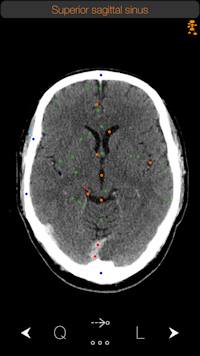 Regions of interest used to quantify signal intensity are shown as dashed lines for the dentate nucleus (yellow) and pons (red). Images courtesy of Radiology. McDonald told AuntMinnie.com that the Mayo team decided to investigate the issue after a 2013 paper by Kanda et al found a connection between gadolinium contrast and brain abnormalities in some patients. The Mayo Clinic was well-suited for the research as it performs most of the autopsies done in southeastern Minnesota, and it also has long-term records on contrast administration for its patients, McDonald said. The Mayo paper -- along with another study by Kanda et al in 2015 that confirmed the findings -- contributed to the U.S. Food and Drug Administration announcing that it is investigating whether the gadolinium deposits pose a health risk. The Mayo team plans to continue its research in the area, specifically looking into whether the gadolinium deposits represent a health risk -- which hasn't yet been demonstrated -- and also whether brain deposits are more common with certain types of gadolinium contrast agents. To McDonald, the public health implications of Mayo's research aren't as important as the patient safety aspect. "Our first and foremost duty is to patients to make sure they are safe. That's why we did this," he said. "I hope we find that it's nothing, that these deposits are biologically inactive." Runner-up: Gadolinium-based contrast agent accumulates in the brain even in subjects without severe renal dysfunction: Evaluation of autopsy brain specimens with inductively coupled plasma mass spectroscopy. Kanda T et al, Radiology, July 2015. To learn more about this paper, click here. 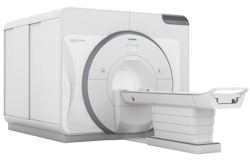 Typically, the winner of the Minnies award for Best New Radiology Device is a clinically oriented system, so it's unique that this year's laureate -- the Magnetom Terra 7-tesla MRI scanner -- is designed primarily for research use. Siemens' Magnetom Terra 7-tesla scanner. Image courtesy of Siemens. Terra is an ultrahigh-field MRI scanner that Siemens unveiled in June 2015 at the International Society for Magnetic Resonance in Medicine (ISMRM) meeting. It's intended to provide the benefits of 7-tesla scanning for basic, clinical, and neuroscience research environments. The scanner is built around a 7-tesla magnet manufactured by Siemens that's 50% lighter than comparable systems, according to the company, and Terra sports 8-channel parallel radiofrequency transmit coils with 64 receive channels. Available gradients are rated at 80 mtesla/m at 200 tesla/m/sec. Siemens is positioning Terra as a powerful tool that will enable sites to perform research that can be translated into clinical applications. Uses include in vivo visualization of hippocampal substructures with 0.2-mm in-plane resolution, which could help in the analysis of patients with temporal lobe epilepsy and Alzheimer's disease. Another option is ultrahigh-resolution functional MRI in the brain sensor motor area for better accuracy in the presurgical evaluation of cancer patients, while proton MR spectroscopy at 7 tesla can provide both anatomic and metabolic information. Siemens has been active in the research market for investigational 7-tesla scanners for years, but the company said it plans to secure regulatory clearance from the U.S. Food and Drug Administration and obtain the CE Mark in Europe for certain neuroradiology clinical applications. Radiation dose monitoring software has dominated this category of the Minnies in recent years, and the 2015 edition is no exception. But DoseWatch Explore from GE Healthcare offers a new twist on the concept with its ability to be downloaded from the cloud, getting users up and running within hours. GE already offers DoseWatch, an enterprise-level software suite first announced in 2011. DoseWatch is designed to provide sophisticated radiation dose tracking and reporting from multiple types of imaging systems and vendors. However, the suite is a relatively heavy lift from a software engineering perspective, requiring integration with a facility's electronic medical record and RIS. DoseWatch Explore is a much simpler cloud-based version of DoseWatch, according to Agnes Berzsenyi, general manager of global product management at GE Healthcare Services. GE partnered with Microsoft to use its Azure cloud platform to host DoseWatch Explore, so users can easily download the software and have it up and running quickly. Screen shot of DoseWatch Explore. Image courtesy of GE. DoseWatch Explore is currently available for select GE CT scanners; it extracts radiation data from modalities, analyzes the information, and returns the data to users in reporting formats that make it easier for them to gain insight into their dose levels, Berzsenyi said. It also provides alerts if thresholds have been exceeded for certain studies. "It makes the invisible, visible," Berzsenyi said. GE users have already employed the software to analyze radiation dose levels on CT scanners that use its adaptive statistical iterative reconstruction (ASIR) technique compared to those that don't. 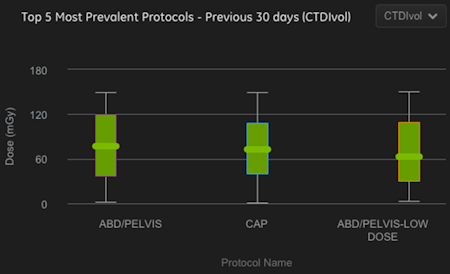 The results suggest that ASIR systems have 24% to 34% lower dose with comparable protocols. GE announced DoseWatch Explore in May, and several sites have installed the software. GE is working on globalizing the software for Europe and Canada. RadLogics is a Silicon Valley start-up that is developing image analysis software called AlphaPoint to help radiologists perform their jobs more efficiently. The company is positioning AlphaPoint as a sort of virtual resident that can take over and automate some of the more time-consuming aspects of image interpretation, such as measuring, searching for, and characterizing findings, according to Moshe Becker, co-founder and CEO of the company. RadLogics has integrated its software with the Aspen Lung application from MRS Systems. Image courtesy of RadLogics. Sites using AlphaPoint send raw modality data to RadLogics servers in the cloud, which after a few minutes of processing send back a summary report. This report can be pushed into a site's existing reporting environment, such as PowerScribe 360 from Nuance, and included in a preliminary report that radiologists can add to or subtract from. RadLogics first unveiled AlphaPoint at the RSNA 2014 meeting; since that conference, it has focused on addressing radiology's hottest clinical procedure, CT lung cancer screening. The firm has developed algorithms for analyzing CT images and also for reporting data to the American College of Radiology's Lung Cancer Screening Registry. RadLogics has been working with MRS Systems to integrate AlphaPoint into that company's Aspen Lung software for lung screening, patient tracking, and nodule reporting. A customer in Texas is planning to go live with the integrated software in November, Becker said. The winner of this year's award for Best Mobile App is CT Anatomy, which was developed by George Michalopoulos, the CEO and founder of iCat Medical Software. The CT Anatomy app. Image courtesy of iCat Medical. Originally a radiographer at a hospital in the U.K., Michalopoulos was frustrated by the lack of real-world apps that displayed human anatomy. Apps based on medical illustrations were available, "but you never see illustrations in real life in CT," he told AuntMinnie.com. So in 2009 Michalopoulos began developing an app as a side project, releasing iRad CT in 2010. Inspired by the response to the software, Michalopoulos continued working at his hobby, releasing CT Anatomy in 2012. The side project has now turned into a business. Michalopoulos currently employs five people who work full time on medical apps, with a number of part-timers also helping out. The company has a stable of 10 medical apps, with CT Anatomy remaining its flagship product. CT Anatomy educates users on the appearance of normal human anatomy as seen on CT. The images are based on actual human scans that are scrubbed of identifying information. iCat has recorded more than 15,000 downloads of CT Anatomy from the iTunes App Store. The software is available as a standalone offering for $9.99 or as part of a bundle with two other apps: X-Ray Anatomy and a radiography positioning atlas. CT Anatomy is currently on version 6, but iCat hopes to make version 7 available this month. The new iteration includes better navigation with one-finger scrolling, easier navigation between the mediastinum and lung windows, and various bug fixes. 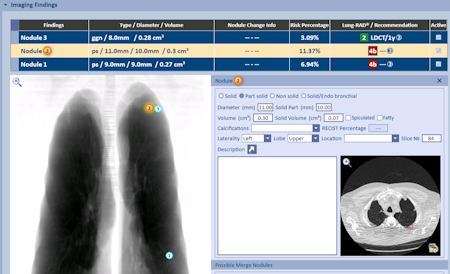 What's more, iCat has doubled the number of chest images available, shifting from 25 to 50. Michalopoulos and iCat also have a secret project in the works that promises to make use of artificial intelligence, but fans of the company will have to wait a bit longer before that product is available. The Minnie award for Best Radiology Image goes to a German group for its PET image of a radiotracer that can be used for both diagnostic and therapeutic applications. The tracer was developed at Heidelberg University Hospital and the German Cancer Research Center, and it's based on a prostate-specific membrane antigen (PSMA) inhibitor called PSMA-617 that targets the enzyme on the surface of prostate cancer cells -- even if the cells have metastasized to other organs. The agent can be labeled with gallium-68 (Ga-68) for diagnostic applications or lutetium-177 (Lu-177) for therapy. The Minnies award is actually the second acknowledgement the German team has received for its work. The image was also named Image of the Year at the 2015 edition of the Society of Nuclear Medicine and Molecular Imaging (SNMMI) annual meeting. 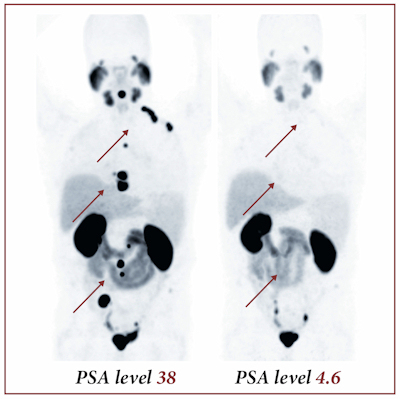 The images show pre- and post-therapeutic PET scan with Ga-68-labeled PSMA-11, demonstrating the influence of therapy with Lu-177-labeled PSMA-617. The images show a positive response to therapy, with both radiotracer uptake and the patient's PSA blood levels dropping significantly, according to Dr. Martina Benesova of the German Cancer Research Center.